Can-Am leaves no stone unturned with its exceptional line up of side by sides. You’ll get all the highly desired features wrapped into one impressive package. Enjoy comfort, capability, and pure power when you choose to invest in a Can-Am UTV. There’s no shortage of options in the line up. You’ll be able to find a model that has been skillfully designed to match your riding style. 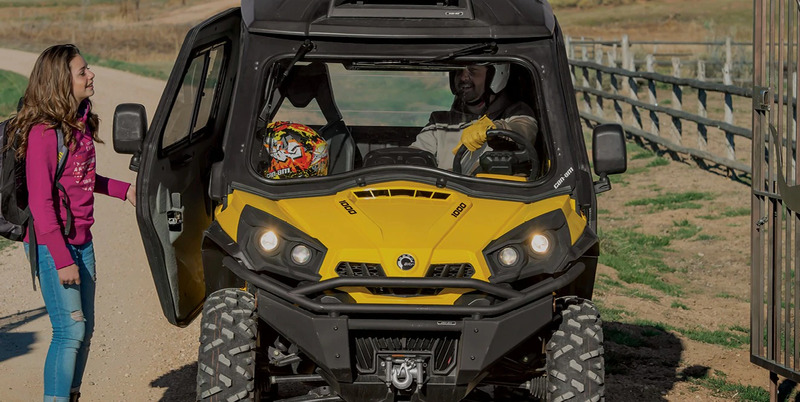 Whether you plan to use your Can-Am side by side as an assistive powerhouse on the job site or to hit the trails hard, you’ll be able to accomplish it all with comfort and ease. When it comes to the Commander, you can venture anywhere you heart desires. Hit the snowy mountains or the mossy forest as you wish because this Can-Am UTV knows no bounds. When you need a reliable machine that’s going to help make your workload more manageable, choose the Defender. You’ll have no trouble hauling your tools or transporting workers across the job site in this Can-Am side by side. Come check out our complete selection of Can-Am side by sides right here at Mad City Powersports. We’re located near Madison, and Portage WI, in Deforest. Our highly trained team is ready to help you find the perfect model and can answer any questions you have.